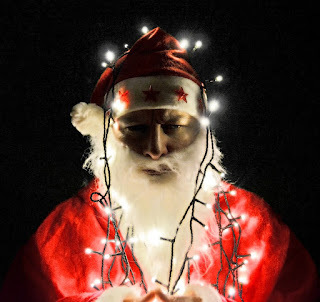 CNF/Essay by Donal Mahoney: "A Not-Too-Jolly Santa Claus"
I know this story to be true because I know Ruben and he wouldn’t lie even though Ruben and I have never met. He lives in Alabama in a hollow and I live in St. Louis. But that makes no difference. We met accidentally by email because of the one thing we have in common—the love of poetry and prose. We’ve been exchanging emails ever since about the sundry matters of life. It’s easy to tell the truth to someone you have never met and very likely will never meet, age and distance being what they are. Ruben, as he explains it, was once a popular teacher at a rural middle school where each December students would pick a faculty member to be their Santa Claus for their big party. The kids always picked Ruben. He didn't know if they picked him because of his size or his popularity or both but he could not escape the honor. The problem was, Ruben hated playing Santa Claus. Having spent his childhood in poverty, with Christmas no different than any other day, even worse emotionally for him and his brother, he did not feel like playing Santa. He told another teacher it was like a rabbi being forced to dress up on Halloween like Adolf Hitler. Nevertheless he always played Santa but with great reluctance. A big man, he needed only one small pillow to flesh out his ample tummy. And the beard looked natural on him even when he wasn’t gray. He must have been a good Santa despite his feelings because the children loved him and voted for an encore performance every year. For 28 Christmases, however, Ruben in his off hours was a bit merrier. He would drive another teacher dressed as Santa to the children's ward at a local hospital. He himself would never play Santa at the hospital even though the nurses told him he would be perfect for the role. Instead he let the other Santa cheer up the young patients. But each year Ruben noticed he took greater pleasure in seeing how the truly sick kids became more joyful when Santa talked with them and gave them their gifts. In spite of bad memories of his own Christmases past, Ruben enjoyed seeing the smiles on their faces. What really gave Ruben a lift, however, was seeing the children open their gifts. Christmas gifts were not something he himself had ever had as a child. Poverty is always difficult to live with but rural poverty is often hidden and that was the case in Ruben’s family. No one talked about it. They just waited for the day to be over so their everyday poverty could resume. They were used to that. Even after he married a wonderful woman, Christmas for Ruben was bleak. As a teacher he would be on Christmas vacation but his wife was a nurse who had to work all the holidays, usually in intensive care. They had no children of their own and no family members on either side lived nearby so Christmas was a difficult time for both of them. All the memories of his impoverished childhood would come flooding back while Ruben ate sandwiches on Christmas Day and waited for his wife to come home from work. She was the one bright spot in his life and he always did his best to be upbeat for her when she arrived but at times that was like trying to lift a giant barbell off his soul. Now Ruben and his wife are both retired and Christmases are a little better. They put up a tree now and have found a church they like to attend. They even exchange a few gifts, items they might need and always one “surprise" gift—usually a box of chocolates for his wife and after-shave lotion for Ruben. His wife has time now to make a turkey on Christmas Day and her apple pie is very good. But Ruben himself still tells folks at the local diner that when he was a child, Santa was always missing in action. The other customers understand because many of them know from experience that poverty in childhood leaves scars that last. And poverty in the hollow where they live didn’t always end with childhood.